The Hindi film industry is a tough place to be in. Every day, a bunch odd people flock to Mumbai to try their luck in the movies. “After 14 years of trying to make movies…. finally a release! !”, posted director Vasan Bala on a micro-blogging site a couple of days back. Though Vasan had directed a feature-length film called ‘Peddlers’ in 2012, the film never released in India despite making rounds of several film festivals all across the globe. So, technically ‘Mard Ko Dard Nahi Hota’ is his first film that will release in the theatres. The film has been making some good noise at festivals for a year now but people in the country got a glimpse of it when its international trailer released online last year. The unusual plotline, the deadpan humour and the overall vibe of the trailer struck a chord with those who saw it and suddenly, there was a lot of excitement for the film. The film took its sweet time to release in India and now that it finally has, let’s find out if it lives up to the huge expectations. Surya (Abhimanyu Dassani) lost his mother (Shweta Basu Prasad) when he was very young and found himself raised by his over-protective father (Jimit Trivedi) and friend-like grandfather (Mahesh Manjrekar). The reason behind them being overly worried about Surya is that he suffers from a rare disease called congenital insensitivity. This disease renders a person immune to any kind of sensitivity or pain. As a child, Surya is very close to Supri (Radhika Madan), his best friend in school but circumstances drive them apart. Surya and his family shift to a remote town where his father keeps him confined to the four corners of the house and even tutors him at home in a bid to keep him out of trouble. Surya has a dream of finding chain snatchers and teaching them a lesson as his mother had died in an accident while grappling with a chain snatcher. He idolises Karate Mani (Gulshan Devaiah), a Karate teacher whose videos he watches religiously on a VHS tape. Vasan Bala takes several clichés from Hindi films of the yore and turn them on their head in an amazingly bizzare way. This is a self-aware film that pays homage to several films and elements of the yore which Bala is a fan of. There are references to old Hindi/South Indian films/songs, martial arts films. These references are used wonderfully to evoke humour throughout the film’s narrative. The first half moves at a brisk pace and while the second half does not give you much to complain about, it could have been shorter by a few minutes. The action scenes tend to get repetitive and the climax, though effective, could have been a little shorter. 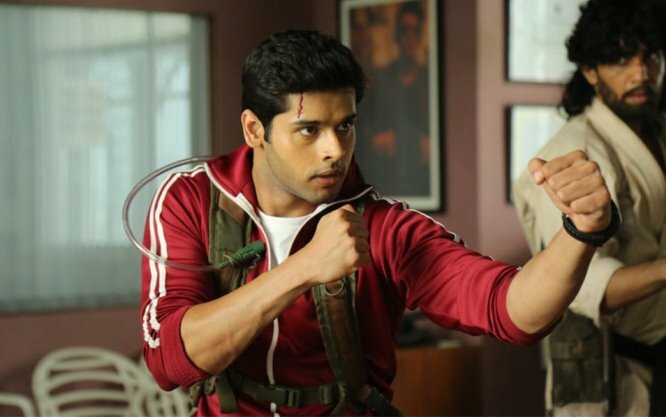 Abhimanyu Dassani slips into the character of Surya effortlessly and makes a very confident. He needs to brush up his diction a bit though. Radhika Madan has proved her mettle as a competent performer right from the time she was doing television. She has a great screen presence and has all the qualities to become a big movie star. Gulshan Devaiah is terrific as both Mani and Jimmy. Despite excelling in every role he has played so far, the actor has not got his due and it is high time the Hindi film industry recognises his potential. Mahesh Manjrekar delivers a nicely restrained performance as Surya’s grandfather. Jimit Trivedi, who made his comeback to Bollywood in a charming role in last year’s ‘102 Not Out’, is wonderful here too. Though he gets lesser scope in the latter half of the film, he registers his presence. Shweta Basu Prasad leaves a mark in a cameo. The film is a technically solid product. Jay Patel’s camerawork should vie for the top honours this year. It also has a terrific soundtrack by Karan Kulkarni which is used sporadically in the film – do listen to the full album. One has seen the brilliance of Vasan Bala in several of the music videos/ songs (remember ‘Ikk Kudi’ from ‘Udta Punjab’) and several TVCs that he has helmed in all these years. With this film, he proves, yet again that he is a master craftsman. Now, one just hopes ‘Peddlers’, too, sees the light of the day.